Great first post, welcome back! welcome to the forum that is a nice way to start out im looking forward to more of your posts. 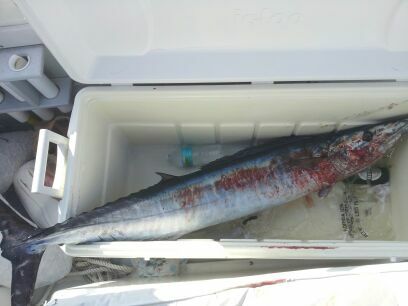 Nice wahoo. There is life off Boynton. Where and How ? By reading the title I was bracing myself for an x-rated post. Glad the bally wasn't naked. Welcome to the forum. I'll take a MDG :beer Longneck please. Congrats on the Hoo... Great first picture posted for sure. Nicely done D$$, that will be a hard first post to follow. The cooler shot is a good problem to have. Some people have told me to cut the hoo in half but not all the way through the skin on the other side so you can fold it in half.